Update April 2016: See our blog, Roaming the Back Roads, for further stories of our travel adventures. From Bend we worked our way (slowly) down to Pahrump, Nevada, where we had reservations in an RV park for 3 weeks. Once we got a ways east, we were in what seemed like endless desert. Flat, hot, and going on and on and on and on. Nevada desert goes on and on. 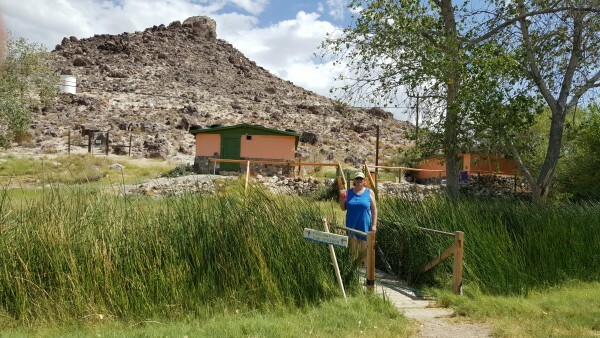 When we were looking for our first stop, I found Crystal Crane Hot Springs in Burns, Oregon. A phone call determined that they had one spot left, so I reserved it. When we arrived, we got suited up and spent over an hour in the big pool filled by the hot spring. At about 102 degrees, it was very pleasant, even given the heat of the late afternoon. We soaked again the next morning before heading out. After the hot springs, we continued south-ish. Central Nevada was a cell phone blackout zone. We couldn’t find anywhere to stay that had decent reception, so we just kept going. 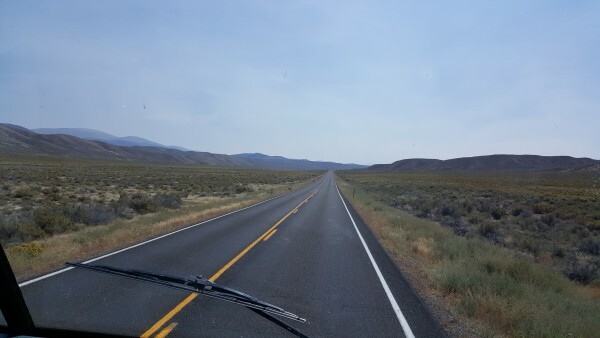 One night in a rest area outside of Winnemucca, Nevada, a night on Austin Summit (which was beautiful, but too high to have enough oxygen), and then in an empty lot in Goldfield, Nevada (not one of the high points). The last night on our way to Pahrump was spent at Bailey’s Hot Springs in Beatty, NV. We saw the signs and decided to stop on the spur of the moment. The place has seen better days, but looked like it was on the way up again. It must have been 105 degrees when we pulled in to an empty dirt lot with dying trees (no shade to speak of). There was a bit of greenery from the spring runoff, though. This spring was much different than Crystal Crane. There were 3 spring houses, each private and for individual use. The manager said the “cool” one was about 100-101 degrees, the middle one was 102-103 degrees and the hot one was 104 (or more) degrees. We chose the middle one but MAN! it was way hotter than 103 (we’ve had a hot tub so had a pretty good idea). We opted for the “cool” one, which was plenty hot for us. I can’t even imagine the “hot” one. Maybe to boil eggs? In front of the spring houses. We finally made it to Pahrump on September 11, 2015. Why Pahrump, you might ask? Well, we needed a spot to settle for a few weeks and Pahrump worked out well. First, I was scheduled to go to New York to the HSCG office for a few days to train a staff member on some website management. We needed to be in a place that had reasonable airfare and flights, and there are direct flight to and from Las Vegas and most every other major city, including Albany, NY (the closest airport to Saratoga Springs where the HSCG office is located). It’s only about 45 minutes to the Las Vegas Airport from Pahrump, so that worked out well. We stayed at the RV Ranch Resort, which was very nice. Imagine – out in the middle of the desert, being able to park under a green tree and have a lawn at your front step! The park was quiet and very pleasant. Just across the street was a huge open field where Duke was able to run and get his exercise. 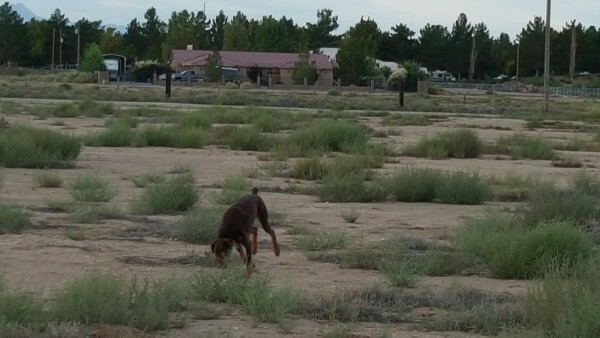 Duke in the desert; RV park behind. We were also scheduled to attend a four-day handgun training course at FrontSight. 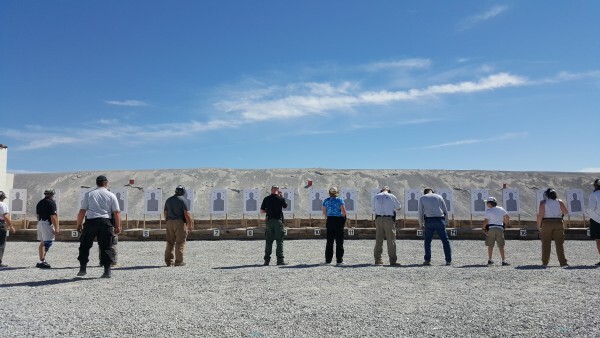 It’s an amazing firearms training institute out in the desert near Pahrump. It was our second trip there and was just as fun, informative and educational as the first trip. My final test scores still weren’t quite high enough to get a graduate certificate (I got a “Certificate of Achievement”) – but they were high enough to qualify me for a Concealed Carry Permit for the State of Nevada. Being on the road, sometimes out in the middle of nowhere, and sometimes alone (if Jere goes to town or something), I feel much better knowning that I am reasonably competent in handling my weapon should it ever (Heaven forbid) be necessary. Handgun training course, FrontSight. Marie in the blue shirt. We left Pahrump in the early morning on October 2nd, on our way to get married in Las Vegas and head off to Arizona and the Grand Canyon. Thanks so much, Cuz! We are planning to get into California sometime in the next while … there are so many things to see and do between here and there! Will definitely stop by when we are there!